More than four-and-a-half-years after their first informational meeting on Atlantic Yards, Community Boards 2, 6, and 8 tomorrow will sponsor another informational meeting, at Long Island University from 6 to 9 pm, under similar conditions, but with a different lineup. The 11/29/04 meeting, held at the Klitgord Auditorium of New York City Technical College, was essentially The Plucky Jim Show,"to quote the Brooklyn Downtown Star, which reported on the polished answers of Forest City Ratner's now-departed Atlantic Yards point man, Jim Stuckey. Stuckey at that point maintained the partly line that "We are not trying to divert funds that are in play today... [Any funds] will be based on incremental revenues that will be brought in by the project.” However, the direct subsidies are up to $305 million, and indirect subsidies and tax breaks are worth at least several hundred million dollars more. Develop Don't Destroy Brooklyn complained that groups that supported the project got ushered in ahead of ordinary citizens. The Empire State Development Corporation (ESDC) did not send an official representative., saying its presence was premature. This time both the ESDC and Forest City Ratner are expected to send representatives. While I haven't seen the rules for Wednesday, CB 6 District Manager Craig Hammerman, who had the unenviable role of moderating in 2004, said that the meeting will run in much the same manner. Project representatives will make a presentation, then attendees will be able to submit questions on index cards. "The community is going to have an unlmited amount of time at the public hearings," Hammerman said, referencing the two-day public hearing to be held on July 29 and July 30. Rather than an opportunity to make statements, the meeting is an effort to make sure that facts get out about changes in the Modified General Project Plan (GPP) that will be subject of the hearing, so people can be prepared to testify. Questions should be "closely tethered to the subject," he said, though, I suspect that the subject of the Modified GPP still points to a lot of potential questions. Below are a few questions I hope get asked--I'll be trying to ask a few others. 1) Why won't a site plan be released before the public hearing next week? 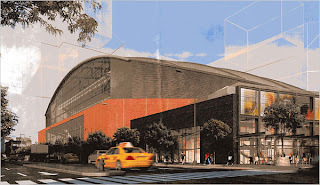 2) Why haven't any new renderings of the arena been released? 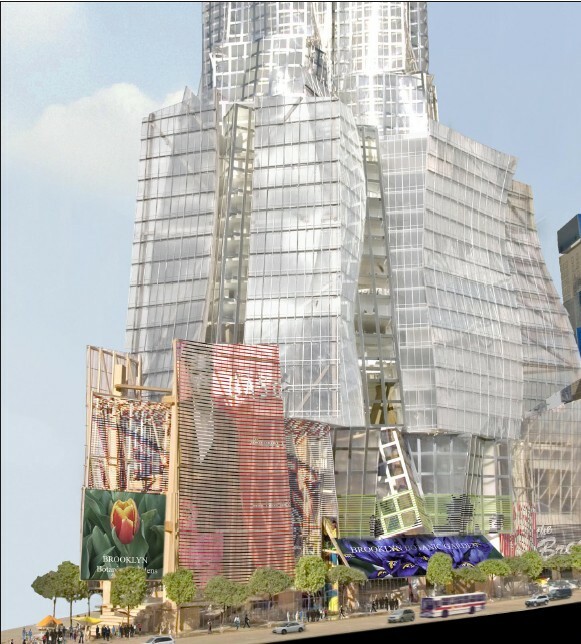 The renderings released last month--example above--are said to be preliminary. 3) Why aren't there any renderings with the massive signage--150 feet wide and 75 feet high--allowed? 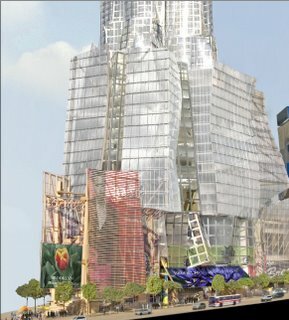 Will any of the renderings show the street-level perspective on the signage, rather than a helicopter-level perspective (right), as in 2006? 4) I already questioned how, given the downturn in the economy, the depressed office market in the city, and the numerous unsold and stalled condos in places like Williamsburg, can the expected office tower and 1930 condos (along with 4500 rental units, half of them at subsidized rents) be built on the projected ten-year schedule? And, if not, how does that change the projections for tax revenues from Atlantic Yards, which the ESDC said last month would be higher than initially projected? 5) Given that recent reports indicate that new construction as well as other first-class apartments will rent at figures lower than the rates projected (in 2006) for the highest tier of "affordable housing" (141-160% of AMI), how confident are you that the affordable housing would be less costly than market rate? What percentage of the affordable housing would be at or above market rate? 6) The Modified General Project Plan (GPP) says that, on a present value basis, the Project will generate $652.3 million of City tax revenues and $745.3 million of State tax revenues. Thus the project will generate $944.2 million in net tax revenues in excess of the public contribution to the Project. This maintains numbers from 2006. Why does the number exclude costs for schools, sanitation, and public safety, as have been included in reports by the Independent Budget Office and even Andrew Zimbalist? Why does it not include affordable housing subsidies? Brownfield tax credits? Green building tax credits? Why does it not include the additional $105 million in subsidies from New York City? Why, if one decline in the projected revenues in 2006 was based on a decrease in expected office space, has the number not been adjusted to account for delayed or nonexistent office space? Do outside economists consider the ESDC's methodology legitimate?